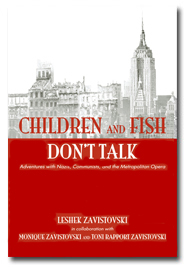 In his memoir Children and Fish Don’t Talk, retired Metropolitan Opera Orchestra cellist and Santa Fe resident Leshek Zavistovski vividly recounts his tale of defection from Poland as a young cellist in 1964, when he took advantage of his position with the Warsaw National Philharmonic to disappear into the streets of Manhattan after playing Carnegie Hall. A steady stream of supporters, many of them met by chance in random circumstances, smoothed the way for the young man, providing lodging, money, and legal assistance. But it was far from an easy path, even for a professional musician, who eventually found safe haven in New York’s cultural icons, the Juilliard School and the Met. Zavistovski skillfully describes his anxieties, passions, and fears as he weaves a compelling story often filled with intensity and danger. To his credit, the author balances all this adventure and panic with a hefty dose of humor, such as his off-color challenges with the English language. His story of the struggles of life in a repressive regime didn’t start with the Cold War, however. Born in Warsaw in 1938, Zavistovski lived with the terrors of war from his infancy, as Poland eventually suffered under both Soviet and Nazi assault. When he was four, his Jewish mother and Catholic father, who was active in the Resistance, made the difficult decision to go into hiding in separate places and send their sons off with a group of orphans to a rural village to wait out the war in supposed safety. Taken in by a widower tailor with a daughter the same age, the young boy adjusts to his new life in the village, while his homeland is devastated in the Warsaw Ghetto Uprising of 1943. But all was not calm in the little village. In a chapter worthy of its own screenplay, Zavistovski reveals how he was kidnapped by Cossacks, who eventually turned him over to a Soviet general who took him under his wing. He was given a tiny uniform, handily picked up the Russian language, and grew to revere his new father figure—once again adapting to new circumstances, this time on the opposing side. Although the bulk of the book is a searing tale of his life during wartime and the drama of defection, classical music buffs will revel in Zavistovski’s insider tone about his long career with the Met, experiences on tour, and evocations of his favorite instruments. Christine Barber’s third crime novel has all the great ingredients that set her previous books apart. Her first book in the series, The Replacement Child, was named a New York Times Notable Crime Book and won the Hillerman Prize. And last December, When the Devil Doesn’t Show won Best New Mexico Book at the 2013 New Mexico–Arizona Book Awards. Barber’s books offer well-observed details about Santa Fe culture, clammyhand- inducing crime depictions (not for the faint of heart), and nuanced characterization that exceeds one’s expectations for the genre. Detective Gil Montoya and medic/reporter Lucy Newroe, not without a bit of friction, pursue the trail of an arsonist and murderer, hoping to stop him before he strikes again. Barber, who lives in Albuquerque, has a world-class knack for maintaining suspense and pace. From his headquarters at the Rancho de Chihuahua dog sanctuary, in Chimayó, author Steven Kotler is doing nothing less than developing a unified theory of the potential for rapid 21stcentury human evolution. Perhaps even more unlikely, in this book he’s doing so by scientifically analyzing the paradigm-exploding feats accomplished by extreme athletes in the past two decades—death-defying freeskiers, big-wave surfers, BASE jumpers, and even skyakers, who skydive into rivers with kayaks. His basic theory is that they have all learned to tap into flow, a state of awareness with distinct physiological and psychological components, which enables them to accomplish the impossible. Regularly. Furthermore, he writes, we can all learn to access flow. The Rise of Superman is a marriage of extreme sports reporting, gonzo science writing, and radical self-help lit: Kotler takes us along on many exciting ventures into the gnarliest gnar, breaks them down into their constituent parts, and puts it all back together as an inspiration to start looking for the Superman inside ourselves. This weighty (both in mood and in heft) novel from Las Cruces author Robert Boswell orbits around 33-yearold therapist James Candler, whose outward sheen of success is about to acquire some major self-inflicted dents. The book is also peopled by a group of challenging, mentally ill and/or developmentally disabled young people whom Candler counsels. These characters are brilliantly evoked, from the beautiful, naive ingenue Karly Hopper to schizophrenic Mick Coury, who is constantly going on and off his meds, trying to find a balance between being functional and feeling truly alive. Boswell’s narrative wedges itself into the daunting realities of unlucky, at-risk people whose life stories often don’t have happy endings. He writes here with grace and compassion, and without pulling any punches.